If you’re reading this, maybe you’re in search of a living philosophy to broaden your perspective of self and the world around you. Cosolargy says the sun is the center and through its rejuvenating light we receive cosmic knowledge and understanding. Not only does the sun reveal untold truths about our universe but a deeper understanding of oneself. 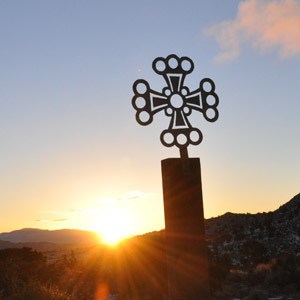 For 40 years community members have enjoyed the serenity of this unique desert Sanctuary spread over 1,200 acres in a mountain valley only 20 minutes from downtown Reno, where we meet for beautiful sunrises and Community fellowship. The place to go for optimal sun gazing, to be near nature and for healing the spirit. The deeper your understanding the richer your experience. Which is why we offer a progressive foundation of teachings to unlock the psyche and extrasensory perceptions, and develop a higher state of Consciousness and Being by working with solar light-energy. I enjoy the association of like-minded and personable individuals that attend. It is both refreshing and rejuvenating. I personally believe Gene Jr. has done a wonderful job in picking up the reins. I can honestly say I have never been to a church where so many members truly believe and share so many of the same common beliefs as in our walk on the Path of The Way, and methods to employ in getting there.